It’s difficult to describe the feelings building up to an experience so significant and poignant, one which you know will be unlike anything you ever have or ever will experience in your whole life. I arrived in Cali just five days before my trip back to the Amazon to revisit the exact spot where I had my diving accident 5 ½ years ago. The spinal cord injury I sustained there had life-changing consequences which I still live with today and which have taken my life down a completely different course. It’s impossible to underestimate how pivotal that moment was. I now feel like a completely different person to the one I was on New Year’s Eve 2009 and my outlook on life is almost unrecognisable from what it was back then. Furthermore I’m well aware that I’m doing completely different things with my life than I would have been otherwise. Honestly I have no idea where my life would be right now had I not had the accident; if I would still be living in Colombia or if I would have returned to the UK, I just don’t know. One thing I feel am certain of is that my life would have been more mundane, in spite all the suffering and disappointment and I suppose that is some consolation. My perception of myself and what I’m capable of have altered dramatically as a result of so many extraordinary things that have happened since then. For all these reasons I knew this was going to be massive and I was as nervous as I was excited about what lay ahead. 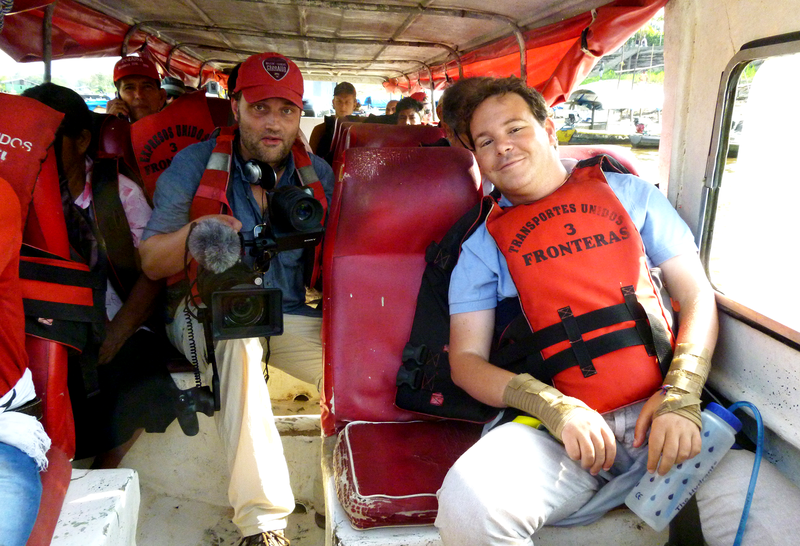 I had made two previous attempts to get to the Amazon, firstly in 2005 and then in 2009 and I was thwarted on both occasions for completely different reasons. Finally it seemed like I was going to have the Amazon adventure I’d missed out on but now of course with the additional challenge of being wheelchair-bound and paralysed from the elbows down. Secretly I’d known for about the last three years that one day, when the circumstances were right, this was the trip I must do. The reasons for me had always been very clear but more difficult for others to understand. Many people I’d spoken to found it almost unfathomable that I would want to go back to the place where my life nearly ended and at the rational level that makes complete sense. The urge to do this this came from somewhere much deeper, it was visceral and inescapable. Never before had I felt so strongly compelled to undertake something and once I’d made up my mind I knew nothing would get in my way. I had no idea how I would feel upon arrival at the scene of my accident nearly six years later. Would I even remember? Would I burst into tears? Whatever the outcome deep down I knew it was the right thing to do and that I was now strong enough to deal with the consequences, however traumatic. Had I gone back just a couple of years after the accident when the trauma and was still fresh and as yet with little reason to feel good about life I think it would have been too difficult to deal with. At that point I still hadn’t overcome the disappointment and despair of being confined to a wheelchair. But now things were different and my life had a purpose again. I was ready for this and besides I knew it was extremely important, if not the most important thing I would ever do. The fact that I was returning with the two friends who were with me when it happened made me believe all the more strongly that this was something serendipitous. Terence, my American friend who I hadn’t seen for five years had managed to get time off work to make the trip down from the U.S. to Colombia especially for the occasion. He and Kevin accompanied me through the most hellish days of my life back then and were instrumental in saving my life. It only seemed appropriate to go back with them, in fact it just wouldn’t have felt right if they hadn’t been there to share this with me. 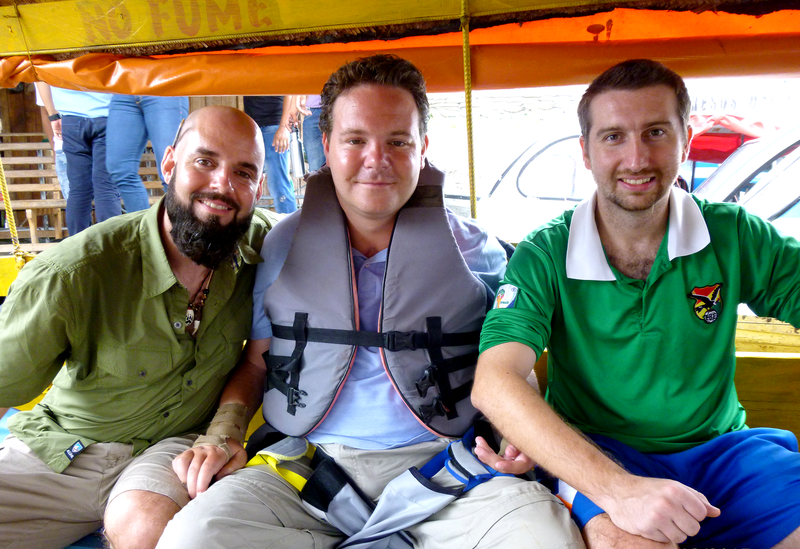 Also accompanying us was friend and our first charity volunteer Will Johnson and his brother David. The final member of the team was the same journalist who covered the story of my accident back in 2010 Toby Muse. After some hurried negotiations in the weeks leading up to the trip he had been hired to come back to the place where the story started in order to make a documentary commissioned by the BBC. 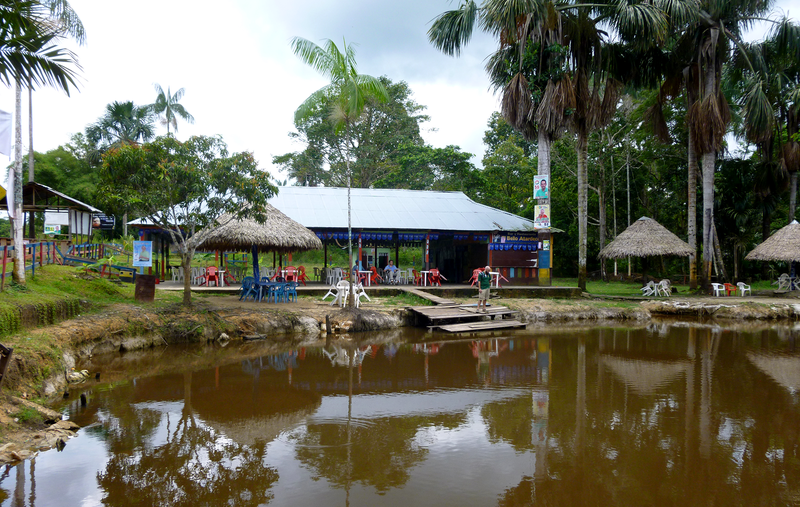 With the logistics taken care of the scene was set and on August 25th early in the morning we took our flight to the small town of Leticia, located in the remote but expansive Amazonas region of Colombia. As we neared our destination I looked out of the plane window remembering the same sight I saw back in 2009. 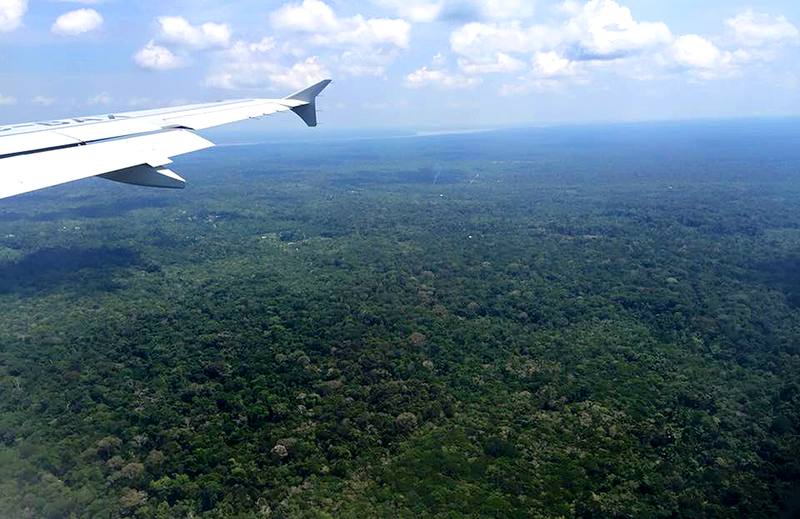 A canopy of densely packed trees as far as the eye could see and in the distance a wide, brown, snaking river slicing through the middle, the Amazon River. A strong sense of déjà vu and nostalgia came over me and I felt powerful emotions swell up inside, I was back. If I needed any more reminding of where I was it struck me as soon as I exited the plane door. I felt that same proverbial ‘smack in the face’ of heat and humidity that is so characteristic of jungle climates. The temperature in this part of the Amazon fluctuates between 28 and 32° C, not as hot as many other places I’ve visited. However combined with the near constant 100% humidity and the suffocating atmosphere it certainly feels as hot as anywhere I have ever been. This sensation was confirmed as I watched the beads of sweat dripping off my friends’ necks and faces as we waited patiently outside the airport for our lift to the hotel. This place has an ability to make you perspire bucket loads within just a few minutes of being outside, that I do remember well. It also brought home to me something I had been well aware of and tried to plan for as best I could. As a quadriplegic I don’t sweat nearly as much as I should, hardly at all in fact. The reason being that when the body gets warm it sends signals to the brain which in turn sends signals back to the skin to release water held in the sweat glands in an attempt to cool the body. Due to the lesion in my spinal cord these messages going to and from the brain get interrupted and therefore, although the capacity to sweat is still there, the body no longer sweats properly in response to heat. As you can imagine this can be quite dangerous if left unattended. My body could very quickly overheat leading to dizziness, shortness of breath and ultimately heat stroke or even worse. Looking out over the Amazon from the aeroplane window, I was back! On day two we woke up early to catch the earliest boat to Puerto Nariño, our spirits were high and I knew that today was the day the real adventure would begin. I was well aware also that it would be the first day of getting on and off boats and that would mean lots of improvised moving and handling procedures for my team. I had mentally rehearsed such manoeuvres many times in the days leading up to the trip but I knew that the specific demands of each situation could, in reality be very different. Getting on and off boats and safely seated was uncharted territory for me and of course there are no manuals on wheelchair travel in the jungle. Luckily I had complete trust in my mates who I knew were physically strong and competent. Additionally I was aided by an extremely useful and well-made piece of kit called an emergency evacuation sling. Due to the unavailability of hoists in remote parts of the world a sling like this really is an indispensable piece of equipment. Now its true value would become evident. 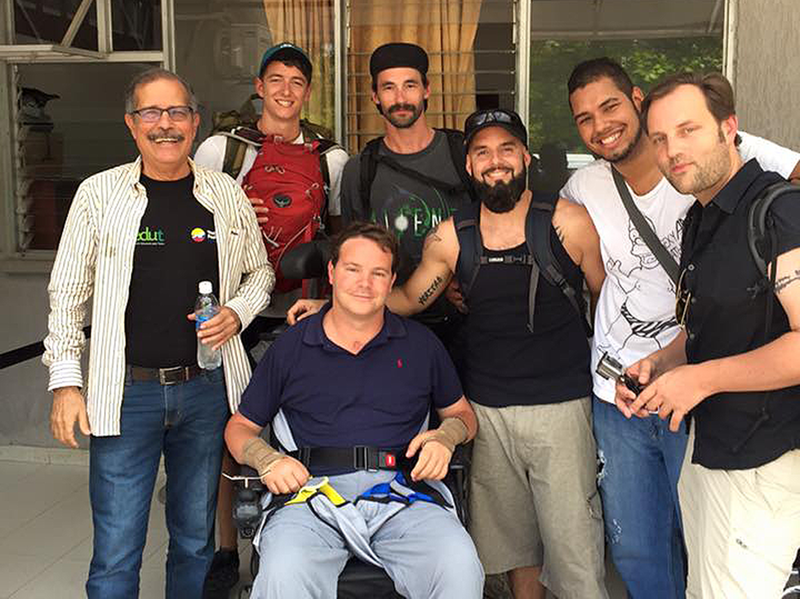 Without this sling or a similar such item it is impossible to imagine how any kind of adventure travel as a quadriplegic would be possible. If you are reading this and wondering where you can get your hands on one it’s courtesy of an excellent company called Pro-Move. Set up by a disabled man himself I am more than happy to use this blog to advertise their excellent products. As it turned out the first transfer from the jetty to the boat was relatively easy. The sling enables you to be held by multiple carriers due to its user-friendly design and a multitude of handles at various points around the body. In this instance it required three of us to get me from the harbour down a steep slope to the boat taking a couple of breaks along the way. If I hadn’t before I now realised the benefits of travelling in a large group. For those of you quadriplegics who don’t have the ability to travel in a large group I found that local people in this part of the world are more than happy to help out. However I would say where possible try to travel in numbers. Slightly trickier was getting comfortable and secured into the boat. The seats were small and due to my lack of lower body strength it was hard to maintain an upright position without slumping forward. With some more quick thinking and improvisation we found that Velcro, which has so often been my saviour, came to the rescue again. We fastened a Velcro strap around my stomach and then round the back of the seat and thankfully that was sufficient to hold me in place. Unfortunately what this also meant was that in the event of a capsize I would effectively be strapped to the boat and as such be dragged down with it. However there are times when you just have to trust in the hand of fate and I was reminded of the many bus journeys I took in Peru and Bolivia where the roads scale steep mountain slopes on narrow, unpaved paths. I remember back then looking out of the window to see how high up we were and not being able to see the edge of the road, a sight that strikes terror into the heart of every traveller. In situations like this our life is effectively in the hands of an unknown driver who could have had a late night out the night before or not have slept properly for days. Such moments make you realise how precarious life is, especially when you are travelling in remote parts of the world. Sometimes, disabled or able-bodied there is nothing you can do to ensure your complete safety. But these are the risks that many of us take to see the most beautiful, untouched parts of the world and rather being regarded as reckless they must be seen as calculated risks which could go wrong. Once full our boat departed. 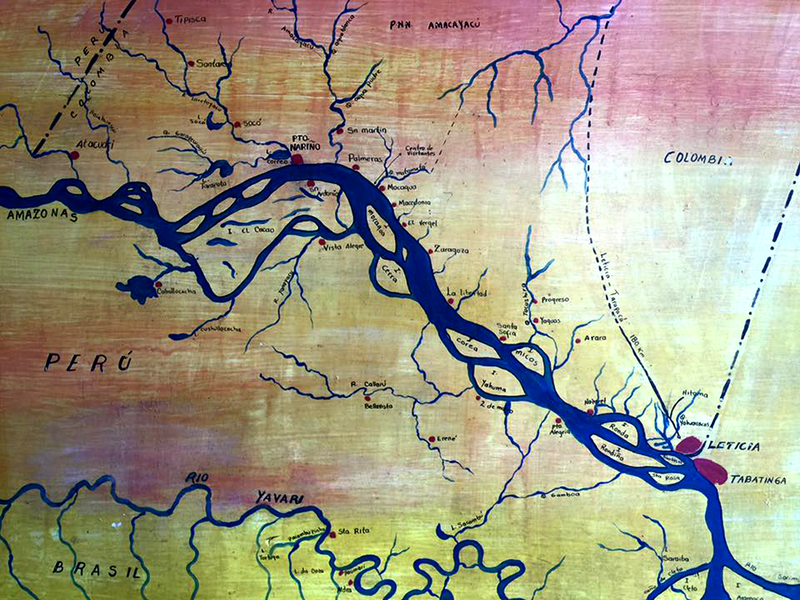 This was my first real glimpse of the Amazon River. The first thing I noticed is how wide it is compared to how it appears from the air. Such is the width of the river that it is impossible to observe any wildlife on the river banks. For that you need to travel down the smaller tributaries at a slower pace. One thing very noticeable however is the floating houses that appear much as any other wooden house does apart from the very conspicuous fact they are floating in one of the world’s largest rivers. These are extreme lengths to go to avoid paying council tax I thought to myself. Further down river we even passed floating five aside football pitches with high wire fences. Another demonstration of the lengths of human ingenuity and how necessity really is the mother of invention. After a couple of hours we arrived at our destination and prepared to disembark for the first time. Already it seemed we were learning and it was a much swifter procedure getting off the boat than it was getting on. I’d left my electric wheelchair at the hotel in Leticia and would be using a basic, large wheeled fold up wheelchair for the duration of my stay in the village. The drawback of this is that I would need to be pushed everywhere since I don’t have the strength in my arms to self-propel a manual wheelchair. However it would be impossible to carry an electric wheelchair which weighs 90 kg (more than my own body weight) on and off boats and canoes. Taking in our new scenery it was clear to see that we were now in the thick of the jungle, with lush trees surrounding every path and road it is a very different feel to Leticia which is a built-up town of 40,000 inhabitants. We ascended a steep slope and checked into our hotel, the only hotel in the village. Having arrived early we knew how important it was to take advantage of our limited time there so after a quick turnaround to settle into our rooms and have some lunch we were ready for our first excursion. The first thing on nearly every Amazon tourist’s checklist is to see the famed pink Amazonian river dolphins. When someone first told me there were pink dolphins in the Amazon River I thought, as many people do, that they were pulling my leg or that perhaps they had inadvertently consumed some noxious, hallucinogenic native flora while on holiday. 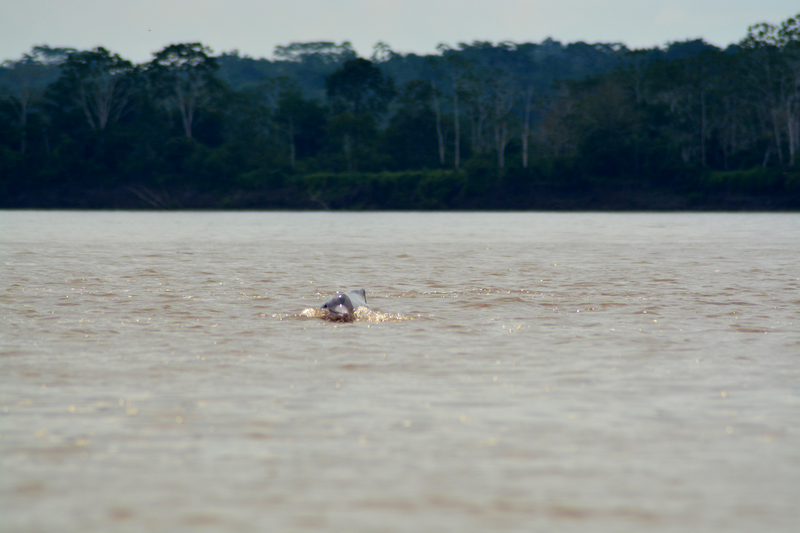 The Amazon River is about the last-place I would have expected to find dolphins, let alone pink ones. Well known for their beauty and exquisite colour they are also notoriously hard to spot and I knew that there were no guarantees we would see any. However it was unthinkable not to make an attempt to see these beautiful creatures and that afternoon, after bartering a deal with a local boatman we embarked on our first expedition to the Tarapoto Lakes. On arrival at the harbour it was immediately obvious that the vessel we were going out on was much smaller than the passenger boat we had taken earlier. Essentially just a wide canoe with a tarpaulin roof, this was going to be much more of a challenge to get me securely seated and comfortable. Drawing on my only previous experience of getting on a small boat I had already decided that the best way was to strap a lightweight plastic garden chair to one of the wooden seating rows in the boat. Then I would put padding on the seat to protect my skin and then once seated use another Velcro strap to strap myself the chair. I had it all worked out in my mind but the question was would it work in reality. This was a key moment, if we couldn’t get this right then it would mean that nearly all excursions would be off. Fortunately, although cumbersome and fiddly to put together, my makeshift canoe seat did the job and in short time we were out on the river looking for pink dolphins. Once well into Lake Tarapoto our captain turned off the motor and let the canoe drift. It was time to keep our eyes peeled and of course the advantage of travelling in a large group meant more pairs of eyes to scan the surroundings. Before long one of us heard a splash and as we all look around I caught the tail end of a dolphin, more grey than pink but definitely a dolphin. We then all looked intently in the direction we’d seen the dolphin in case it surfaced again and much to our amazement it did, and then others, again and again. Over the course of the next half hour we managed to spot various dolphins, some grey but some definitely a translucent pink colour. Some of them even seemed dual-coloured, grey on the top dorsal area and with a pink underbelly. Our captain told us that there were two types: one more normal looking dolphin and one that became a more vivid pink colour as it grew into maturity. Satisfied with what we’d seen from there we went piranha fishing which was slightly less successful but we did at least get to see some of the great variety of fish who abode in the Amazon River. Over the following three days we got to see some incredible sights and experience some extremely tender moments with a variety of exotic animals. I was crawled on by several species of monkeys who even had the audacity to steal my water bottle at Tanimboca National Reserve. 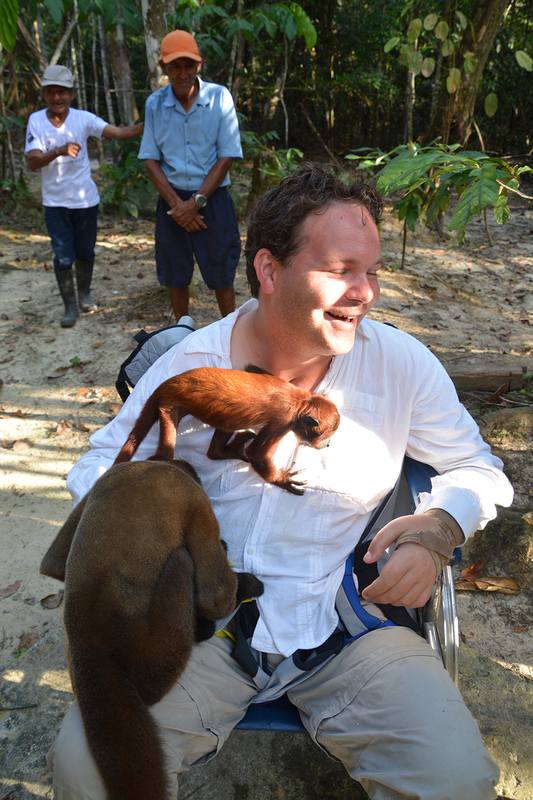 I hugged sloths in a tiny village called Puerto Alegre on the Peruvian side of the Amazon River. In addition we held caimans, toucans and a prehistoric tortoise, the likes of which I’ve never seen before. No jungle adventure would be complete without at least a couple of hairy moments and this was no exception. On one occasion I had to be carried across a bridge over 100 metres long and less than a metre wide carried in a hammock tied to a pole. Lied back in the hammock all I could see was the clear blue sky above while at the same time listening to wooden planks creaking underfoot as my mates carried me across. It was disconcerting and definitely risky but we were reassured by members of the local community who informed us that that this was a common method for carrying heavy cargo from land to boats. The video you’re about to see may look reckless but we spent over an hour analysing and discussing the risks of the situation and checked three different bridges before making the crossing. 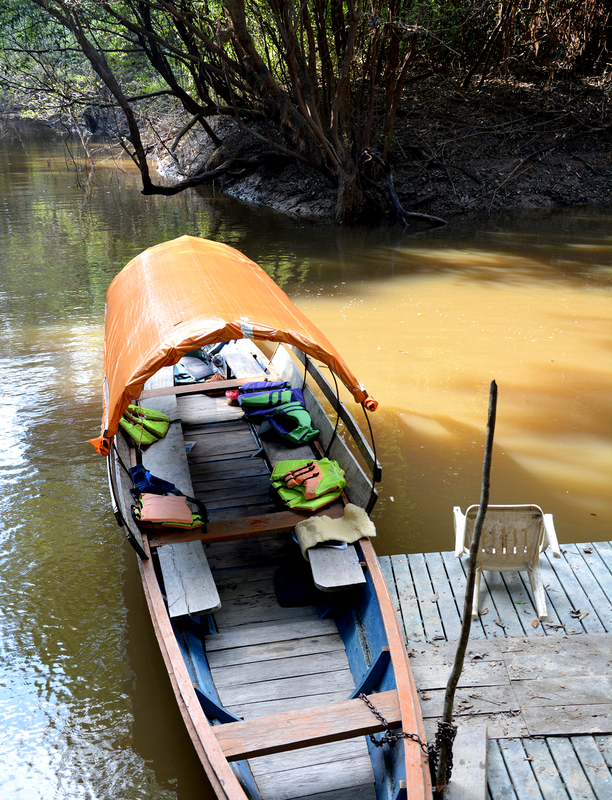 This really was the only way to get across to the other side where there were sloths, caimans, toucans, an ocelot and whole host of weird and wonderful local fauna that I’d never seen before. In the end it was the advice from locals that convinced us it was feasible. On another occasion we found ourselves out in the Amazon late in the afternoon after sunset still in the canoe on our way home after visiting the monkey reserve. This may not sound a big deal but there are plenty of large objects like logs and tree trunks floating in the Amazon which must be avoided at all costs. In a small wooden canoe like ours any impact with a solid, heavy objects could leave a hole in the boat and it doesn’t take a genius to guess what might happen next. As darkness set in we bravely volunteered Terence who is an ex-US Marine to sit on the front end of the canoe with a torch in hand directing us as we meandered slowly through the darkness back to our village. The only thing I could think of doing to mitigate the risk was to check the straps on my lifejacket, pretty hopeless really. The chatter had died down as we all sat in silence trying our best to pretend to each other that we were calm. 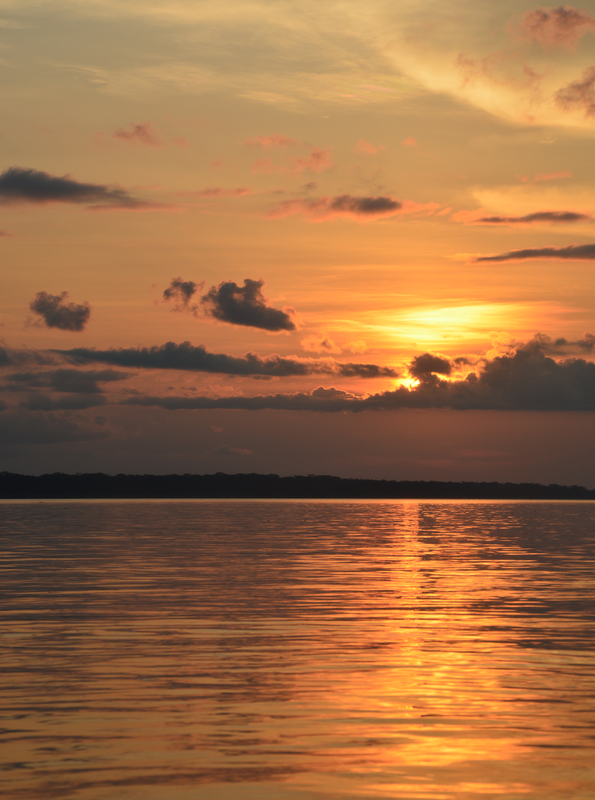 Although scary and definitely something I wouldn’t repeat again we did get to witness a stunning Amazon sunset from the river itself, hopefully a once-in-a-lifetime experience. With every new day we learnt better and more efficient techniques for moving and transferring me from place to place. By day three we had done with the plastic chair realizing it was sufficient just to use the padded cushion from my wheelchair and place it on the wooden seat with my back resting against the side of the boat. The lifejacket served as an inadvertent protection against pressure ulcers by providing padding between my back and the side of the boat. By the end of the trip had we become so well practiced and efficient with our transfers that it started to feel almost like part of a normal daily routine. I can’t tell you how empowering this was for me as a C4/C5 quadriplegic with supposedly a high level of disability to discover that I can still travel in such remote places in relative safety. I now see my opportunities to travel and see the world through completely different eyes. Furthermore I’m so grateful to my incredible mates who were willing, practical and competent in every situation. They made all this possible for me and it’s impossible to overstate how instrumental they were in making this happen. On day four we returned to Leticia, exhausted but elated. I knew that we would all need to have a shower and a good rest in the afternoon. For me personally I knew that tomorrow was Toby’s last day and that meant an early start in order to return to the place of my accident. Mentally and physically I wanted to get some rest and to prepare myself as best as possible for a much more somber part of my Amazon experience. Friday 29th August 2015, I noted the day. We woke early after a good night’s sleep. I had taken it easy the day before and spent the afternoon trying to remember and imagine the scene of my accident. Would it be how I remembered? Our memories of course are fallible things, they can both embellish and miss out important details. I had awoken to an unsettling feeling, I felt in a hurry to get this done as soon as possible, I wanted it out the way. I didn’t need any extra time to ponder on what I was about to do and I was anxious to get on the road to conclude my unfinished business there. As we sat down to breakfast I felt uncharacteristically antisocial, I definitely wasn’t myself. In my head I was trying to play down the idea that something truly momentous lay ahead. As the others chatted and laughed I was in my own world. Terence, noting my uncharacteristic mood perhaps, put his hand on my shoulder and asked me: “are you okay brother?” To which I responded “yup, I think so”. After breakfast we ordered two taxis from the hotel reception, one for me, Terence and Toby and the other for my carer Camilo and Jorge who were accompanying us. Before I knew it we were in the taxi and on our way there. As soon as I told the taxi driver kilometre eight and described what I remembered of the scene he immediately knew where it was. I think a part of me I think was hoping that he wouldn’t know how to get there but I now realised that this was part of my destiny that had to be fulfilled. As the taxi drew on to the motorway I knew we were now just eight kilometres away which I guessed would be about 15 minutes maximum driving time. The tension inside me started to grow. I found myself repeating my memory of the scene over and over mind again in my mind. Then the taxi driver slowed down and drew in to a layby to the side of the motorway, he looked over to me and said: “We’re here”. I felt adrenalin surge inside me and my heart rate accelerate rapidly. The only other time I could remember feeling like this was the day I carried the Olympic torch in my home town in front of 25,000 people. With the lagoon still out of sight Terence and Camilo helped me out of the taxi and lifted me into my fold up wheelchair. In front of me I could see a small bridge with a clearing on the right hand side and I could hear the sound of water flowing. As Camilo pushed me forward over the bridge I glanced over to my right and I saw a small circular pond full of dark coloured water and with kiosks around the border. I recognised it immediately, this was the spot. I was struck by some unrecognizable and powerful emotion, I felt completely blown away but not, to my surprise, sad or upset. I sat there staring at it suddenly catatonic with incredulity, is this really real? Am I really living this?? I thought to myself. Intrigued to find the exact spot I went running into the water I asked Camilo to lower me down some steps to the bank of the pond. I could see right in front of me exactly where it happened. As I got there I looked out over the water, I could see an image of Kevin in the distance beckoning me in. This was it, finally I was here! The sensation of being there again was unlike anything I’ve ever felt before. The only way I can describe it is something like returning to a bad dream you had years ago and filling in the details you’d forgotten. I scanned my surroundings and quickly recognised the hut I saw when I came round to consciousness and lifted my head to look around me. Then it all came flooding back and the memory was crystal clear. This was no lagoon in a lush Amazon backwater as I’d imagined. It was an insignificant, muddy, man-made pool on the side of a motorway. I gave myself an ironic smile, there is absolutely nothing special about this place whatsoever I thought to myself. When the initial shock had worn off we carried out our filming duties with Toby. A few shots of me and Terrance by the pond followed up with a couple of interviews, firstly with Terence and then with me. After that I asked for some space to do a meditation and spend some time reflecting by the pool. I shut my eyes and tried to reflect but couldn’t resist opening them again. I gave up on the idea of a meditation and spent the next half hour just staring, motionless at the water. I reflected, asking myself questions like ‘what if’ and ‘why?’ but I knew deep down there were no real answers and no going back. It was just a split-second error of judgement and nothing more. It was pointless feeling angry or upset and I reminded myself of my reason for coming here, to get closure and make peace. I cleared the thoughts and emotions from my mind and continued to stare at the water. I kept repeating affirmations to myself: ‘you didn’t defeat me’, ‘you didn’t defeat me’ and ‘I finally conquered you’. As the anger and nostalgia diminished I tried to change my train of thought. I knew how important it was lay the demons to rest and feel completely at peace here. ‘You didn’t do anything to me’ I whispered, followed by: ‘it’s not your fault, I know it’s not your fault’ not really sure if I was talking to myself or to the pond. I repeated this in my mind time and time again and then stopped. I took a long, deep breathe in and let it slowly out, and then another, and another. I then laughed at the ridiculousness of talking to an inanimate object like this. ‘I must be mad’ I thought to myself. Then it was time to leave, we all boarded in the taxi and headed back to the hotel. I let out a big sigh of relief and looked over at Terence: “it’s done” I said to him: “it’s done”. 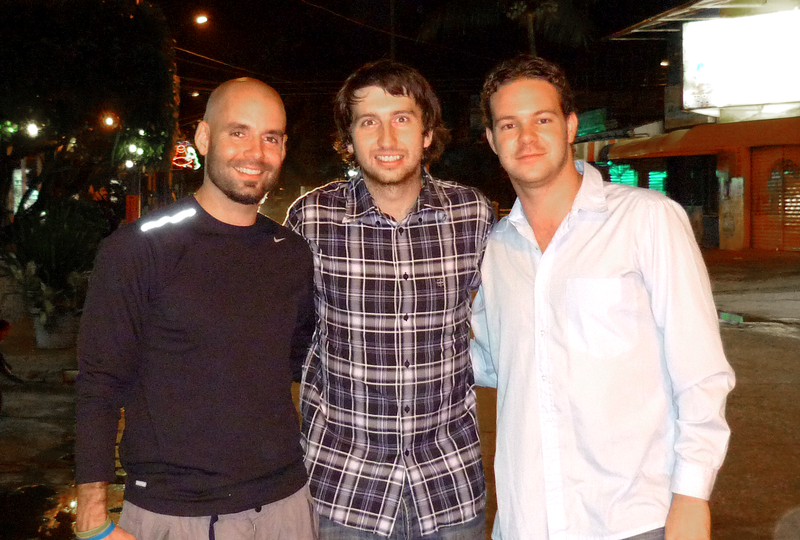 That evening we went out into town to celebrate our last night in the Amazon. Inadvertently we came across the same nightclub I was in the night before my accident and then the bar we were in just before that. I was with Terence and Kevin, the same two friends who were with me that fateful night and in some sense it felt like I was retracing the steps of the last night before my accident, my last night as an able-bodied person. Incredibly I even bumped into the same girl I was dancing with that night, what chance of that in a town of 40,000 people?! The next day we caught our flight back to Cali from Leticia. I woke up feeling quite normal, all things considered. The plane took off and I looked out the window and saw that same sight of trees stretching off into the distance, and then it hit me. For the first time I started to feel emotional. Perhaps the enormity of what I’d just done finally hit home. I don’t know if they were tears of joy or tears of sadness or perhaps a mixture of both. In some strange way it was like leaving someone you love very much, but clearly this isn’t a place I love or hate for that matter. Rather to leave somewhere that played such a significant role in your life, a place that will be permanently etched in your memory that formed such a fundamental part of the story of your life. Sometimes words can’t adequately describe your true feelings because they are so confused and unfamiliar. This was one such instance. A few days after my return to Cali I recorded a brief video blog of my reflections, perhaps realizing that to try and write it wouldn’t fully capture how I felt. I took advantage of a brief moment when I was alone in my hotel room to record myself talking to the web cam. So how do I feel now writing this over two months later? The truth is I don’t really know and I think that’s the main reason it’s taken me so long to write this blog. Sometimes we can search for meaning and conclusions that just aren’t there or that we aren’t aware of yet. Maybe in the months and years to come it will become clear but for the time being I just feel satisfied at having achieved something that for a long time I doubted was possible. It has provided some kind of logical and poetic conclusion to the most significant episode of my life and most importantly it has made me feel grateful, forever grateful for being given another bite of the cherry and another chance at life. One significant difference that I am fully aware of is, as I mentioned earlier, my perception of what is now possible in terms of travel as a quadriplegic person. I love travelling, as much now I did before my accident and for a long time one of the most painful aspects of living in this condition was the thought that I would no longer get to see and explore remote parts of the world. Now I know that’s not true, and that’s an amazing feeling! So I leave this message to others living with a similar level of disability, there’s a big world out there waiting for you to explore. The term inaccessible is relative and sometimes it just means that someone hasn’t done it yet. Don’t be afraid to be a pioneer and please don’t let your disability become a barrier to the things you want to do and achieve. As the great Gandhi once said: “Everything seems impossible until somebody does it”. I want to conclude this blog with a poem I find particularly poignant and inspiring. It’s a poem my sister read me earlier this year and one from which Nelson Mandela drew strength during his years of incarceration. It’s called Invicus by Henry Ernest Henley.